#1 For Engraved & Custom Metal Pens. Rapid Ship, Low Prices. When you need to impress clients. Reward staff or just promote your business in a more high end corporate fashion, metal pens printed or engraved with your message can be a key instrument in your promotional arsenal. Browse our range of engraved pens below and request a quote from us, we guarantee not to disappoint you with our record low pricing and 100% free mock up service. 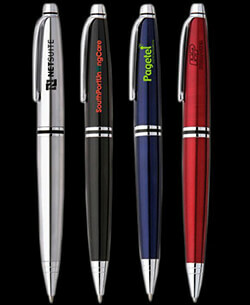 When corporations think of promo gifts, one of the items most often brought to mind is the common pen. Why are these goods so popular though? The truth is that simplicity is often the best solution, especially when reaching out to your clients. With our branded pens, you can give the public something they’re guaranteed to use and increase overall marketing awareness in the community. Dynamic Gift now has a range of stationery available at cheap prices here on our site. We can supply you with the goods you need to make an excellent public impression. We know the diverse range of clients any organisation has, and have tailored our selection of pens to suit different needs. From colourful designs featuring comfort grips to personalised metal fountain pens, we have it all here on our site. Thus you can purchase gifts to be handed out to VIP clients, given away at trade shows or put up as a prize in a competition. Our metal pens have been used by companies all over Australia as ways to improve client satisfaction and increase overall marketing exposure so why not try them for your organisation as well? Dynamic Gift is one of the few suppliers of promo items in the country who runs our own factory. This means custom goods such as our pens are guaranteed to be of top quality as we employ high standards each step of the way. From design to delivery, we ensure you get an end product tailored to give your clients the very best impression. As we run our own facilities, we can also charge wholesale rates as we don’t have to purchase from external producers. With our pens, you combine quality, reliability and affordability in our vast range of items. We also realise that you know best when it comes to the promo goods you hand out. Because of this, we allow you to buy products that come with the exact colours, images and slogans that you desire. There is no limit to what you put on the side of your stationery. Whether you want the items printed or engraved, we will do our best to meet your specific design requirements. In this way, you will receive an order of promotional goods that fits in with your brand initiatives in just the right manner. If you are interested in purchasing any of these tailor made products, you can get a quote by filling in the form to the right. If you find our bulk rates reasonable, we will supply you with a 3D virtual model of the pens you wish to order. If your looking for something more economical then try our range of plastic pens. You can then tweak the design until you are confident that production can commence. We will work with you every step of the way to ensure these corporate gifts are just right for your business. To find out more about our ordering process, contact our team today!